For this weeks blog post I want to flashback to 2013 and a podcast interview I gave on the excellent Tropical MBA Podcast with Dan and Ian. I've been a huge fan of the tropical MBA podcast since day 1 and it's part of my Friday routine to get a blast of 'location-independent entrepreneurship' so I was delighted to appear on the show. The interview came about by chance when I was across in Cebu, Philippines in 2013 on my first visit to the country. I had just recruited my first team members via Chris Duckers 'Virtual StaffFinder' and was across working for a week in Chris's co-working space Location63. It was just before lunchtime and completely by chance Dan Andrews walked in. We went out for a BBQ lunch and Dan asked me to recorded an interview that afternoon, which we recorded upstairs in an empty room for Chris's call centre with Dan balancing the microphone in a coffee cup. Here is the link to the episode and please let me know any comments or questions in the comments below. The two costs and two revenue sources for every event, and why you need to keep it simple. How you can structure deals with hotels to get the optimal setup for your event. 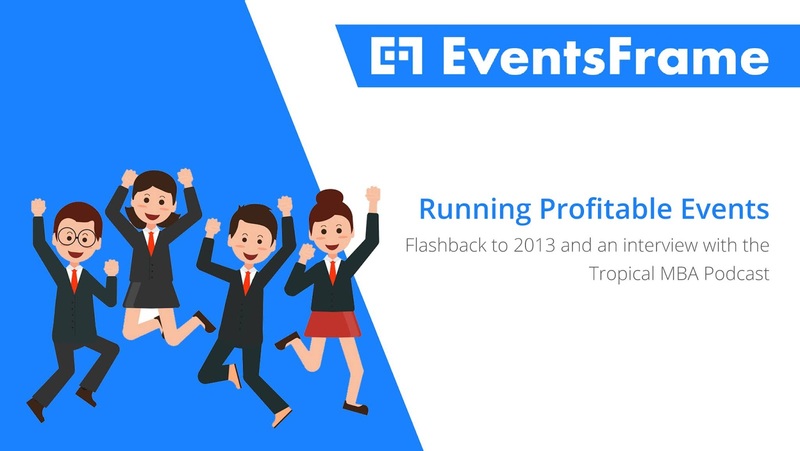 Why you should launch your event with an early bird price, and how that adds flexibility and profit potential. Speakers’ fees and how you can arrange the best setup for both you and the speakers. BTW as a final point our Cebu team is still going strong 5 years later and I still visit once a year :). Hers's Guen, Jane and Neil in our new offices in the Tide. Make the switch today! Sign up at https://eventsframe.com/ for a 30-day FREE trial. Email dan@eventsframe.com with the subject line ‘TMBA-BLOG’ for a special discount code.